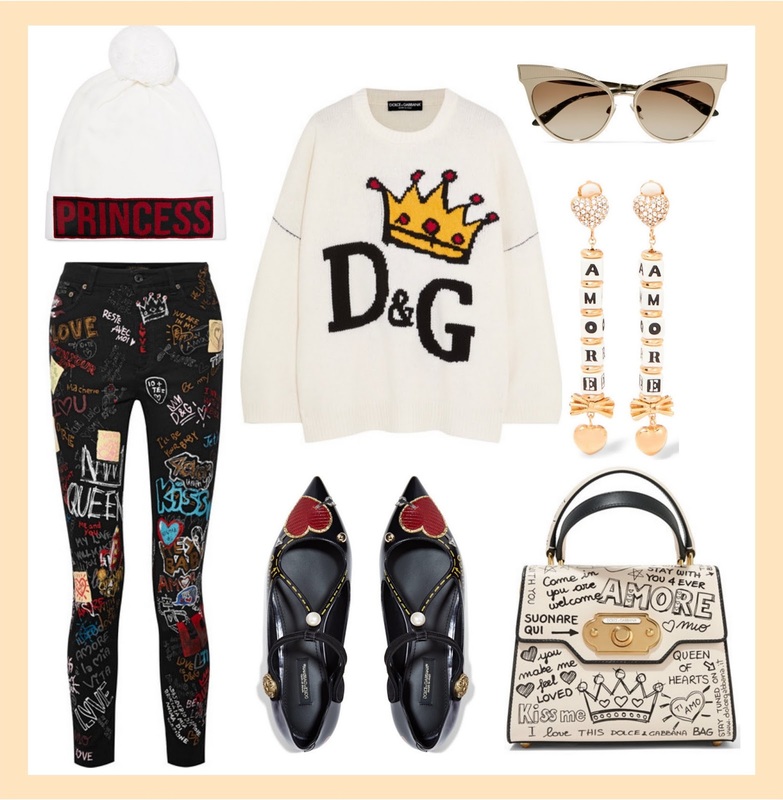 I've been loving all this D&G lately. I paired this oversized wool sweater with these queen high rise jeans that have different graffiti and scribbles all over it. I love the princess wool beanie wit the cute little pom pom it has on it. These point-toe flats have cutes hearts, pearls, and studs on them. I love a good pair of statement earrings, these amore earrings are so adorable. I also love a good pair of sunglasses, these gold-tone cat eye are just so cool. I adore the scribbles and words that are all over this D&G welcome tote, I need it in my life. I love the rainbow colors on this striped wool sweater, the glitter tiger with the word loved underneath make this cool sweater extra unique. These velvet tapered harem like pants are look so comfy and the dark navy blue color is so gorgeous. I'm obsessing over velvet accessories, these bubblegum pink Jordaan velvet loafers pair perfectly with this velvet Marmont belt bag in this beautiful raspberry color. 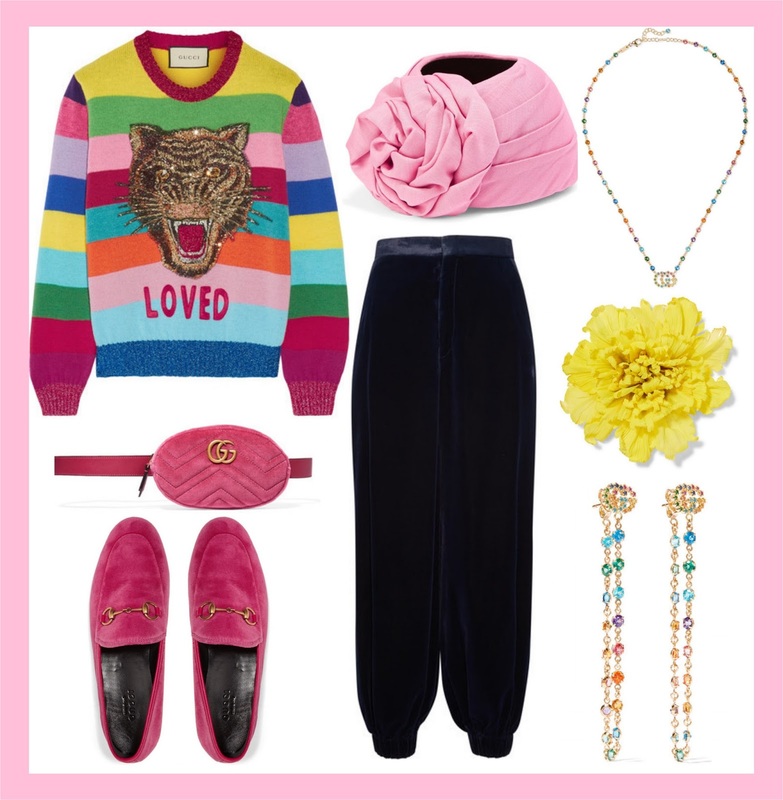 I thought this knotted silk wool blend turban would look so nice with this colorful outfit. For jewelry the I love these colorful multi-stone GG earrings and matching necklace. Finally for a little extra-ness, I added this oversized floral silk brooch. I paired these patent leather pants with this comfy looking cropped hooded sweatshirt and denim jacket, I think all three pieces compliment each other so well. I love all the bags Off-White makes, this large tote in this bright red color features silver screw-inspired hardware and comes with the signature Off-White strap that can be also worn as a belt. I love the simplicity of these silver earrings, that feature the brands initials in a oversized font. These suede ankle boots scream statement piece, I think the belt detail makes these boots a must have. Card holders are some of my favorite slg's, this Off-White card holder has these beautiful black and white stripes that are so iconic to the brand. Loving this wool and cashmere blend sweater paired with these metallic floral pants. I had to pair this look with these amazing burgundy velvet ankle boots. 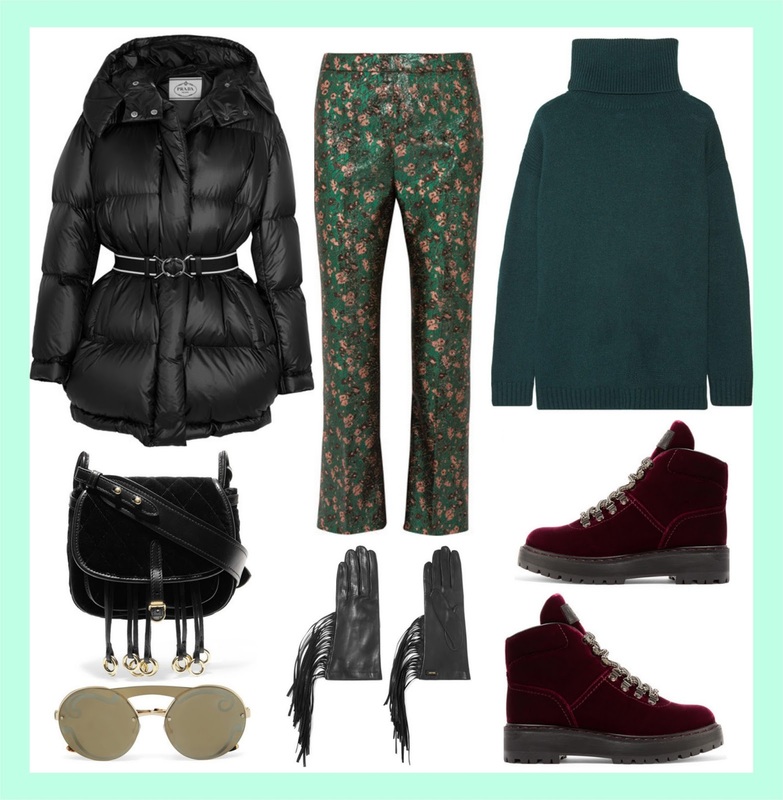 I love a good puffer coat, this belted quilted coat looks like it would keep you extra warm. For accessories the velvet messenger bag is such a cute fall/winter bag. 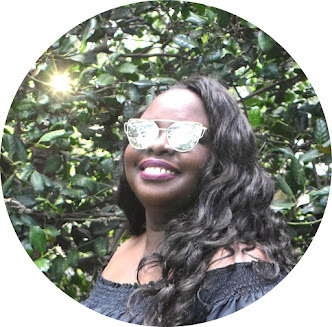 I love the round framed mirrored sunnies with the swirl design on them, they are such a statement pair of sunnies. I also love a good pair of gloves, these super unique fringed leather gloves look so soft and seem like they would pair with any coat or jacket so well. These Burberry district leather and knit sock boots are super fierce, they would make any outfit look good. I love a good tartan print, this reversible wool-blend poncho looks like it would keep you warm all day every day. Stirrup pants are making a comeback, I love these pants paired with this white cotton-jersey sweatshirt. Finally I love this tote accessorized with this super cute Burberry cashmere keychain that would make a great bag charm.